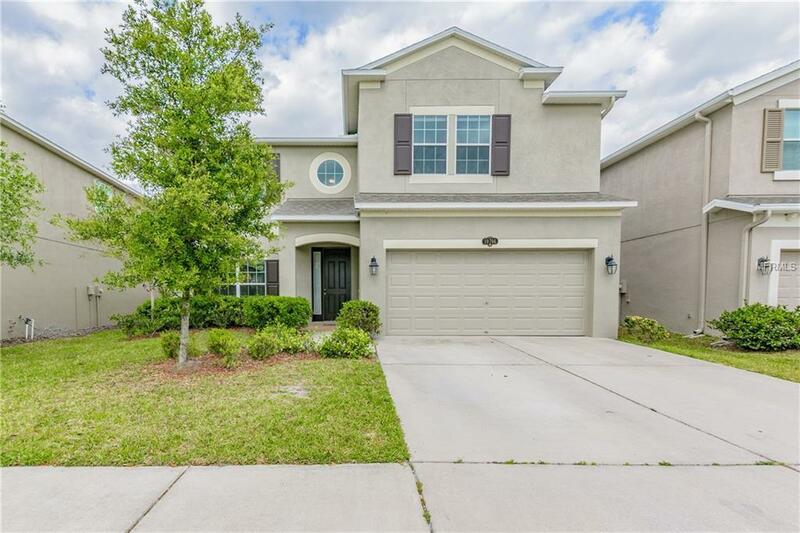 Beautiful, MOVE-IN ready home with 3326 sq ft of living space, 5 bedrooms, 3 full baths, bonus room, and a 2-car garage on a premium lot with NO REAR NEIGHBORS. First floor consists of a formal dining area, a large family room and a guest bedroom with access to a full bathroom. Gourmet kitchen overlooking the family room features 42 cabinetry, oversized island with undermount sink, granite countertops, stainless steel appliances, huge walk-in pantry and a spacious cafe. Family room (14X22) with sliding glass doors to the oversized covered lanai (27X8). The master bedroom is upstairs along with three other bedrooms, a large bonus room, and a second full bath with dual sinks. Spacious master bedroom (18X15) with double doors, tray ceiling, two large walk-in closets, three large windows overlooking the greenbelt/conservation area, and a luxurious bath featuring culture marble countertops, dual sinks, soaking tub with separate walk-in shower. Bonus room (19X14) can easily be used as a game room, study or additional family room. All bedrooms are spacious with ample closet space. All bathrooms have upgraded wood cabinets and culture marble countertops. Laundry room is conveniently located downstairs. Fully fenced backyard. Easton Park is a great community with amenities that include a pool, playground and nature trails. Conveniently located and minutes away from shopping, entertainment, restaurants and major highways. HOA fees include cable, internet and phone. MOVE-IN READY and PRICED TO SELL!! !